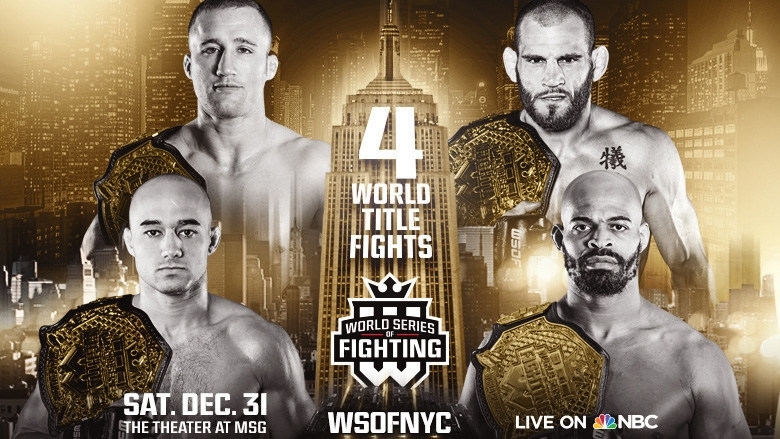 With the unprecedented WSOFNYC New Year’s Eve world-championship extravaganza at The Theater at Madison Square Garden in New York City just weeks away, World Series of Fighting (WSOF.com) announces exclusive travel and entertainment offers for fans. Boasting an unmatched roster of world-class athletes, the stacked eleven-bout, Mixed Martial Arts (MMA) mega-event features four title fights and star-studded match-ups. WSOFNYC will take place on December 31st from 1 p.m. ET to 6 p.m. ET with the main card airing live on NBC Sports (3 p.m. ET – 4 p.m. ET on NBCSN, 4 p.m. ET – 6 p.m. ET on NBC). Tickets are available for purchase at the Madison Square Garden box office as well as online at Ticketmaster.com and WSOF.com and priced at $500, $250, $150, $75 and $50. World Series of Fighting has teamed up with Lyft to offer fans affordable rides to WSOFNYC in minutes. Fans can use code WSOF to get $20 in Lyft credits or by visiting https://www.lyft.com/invite/WSOF to have the code automatically applied once downloaded from link. Code valid for new users only. Existing Lyft users, will receive 10% off their ride to and/or from WSOFNYC by using code WSOF10 or by visiting https://www.lyft.com/invite/WSOF10. World Series of Fighting has also partnered with MTA Getaways to provide fans traveling from Long Island a free ride on Long Island Rail Road to the WSOFNYC Fight on New Year’s Eve. Fans can Visit Ticketmaster.com and use code LIRR to save on WSOF tickets and receive a free roundtrip ride on LIRR. WSOF fans can also save on New Year’s Eve party plans and ring in 2017 with exclusive offers from local hot spots Juniper Bar and The District Tap House Craft Beer Bar & Restaurant. Located in the heart of Midtown West in the Garment District and boasting an extensive list of domestic and international craft beers, The District Tap House Craft Beer Bar & Restaurant will also host an official WSOF New Year After Party. Tickets include a four-hour open bar from 9 p.m. to 1 a.m., complimentary passed appetizers from 9 p.m. to 11 p.m. and a champagne toast at midnight. Partygoers will also receive free coat check service and NYE party favors to ring in the New Year. To book this exclusive offer, fans can visit www.eventbrite.com/e/wsof-new-year-after-party-tickets-29806633443 and use code WSOF2016. $109 per person. “World Series of Fighting” (WSOF.com) is a worldwide premier professional Mixed Martial Arts (MMA) fight promotion dedicated to delivering the best action-packed fights for fight fans by producing the best possible match-ups between elite fighters from around the world. For more information, please visit WSOF.com. Follow “World Series of Fighting” on Twitter @MMAWorldSeries and “World Series of Fighting” President Ray Sefo @SugarRaySefo.